I have partnered with Flatout to create these Fruit Pizza Flats. I have been compensated for my time commitment to work with their product, however my opinions are entirely my own and I have not been paid to publish positive comments. 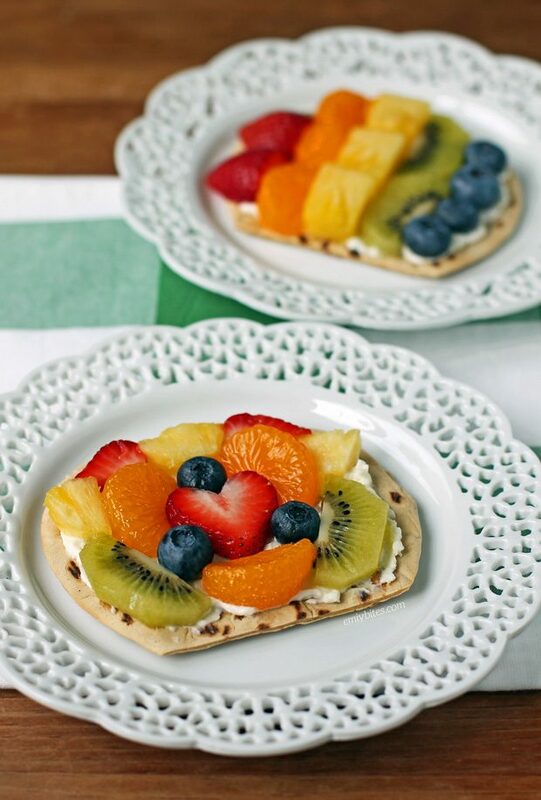 I’m totally obsessed with these easy Fruit Pizza Flats! They take just minutes to make and they’re perfect for a sweet breakfast, dessert or snack. You can easily customize these flats with whatever fruits you like best and get creative making pretty designs. I went with a rainbow of fruit flavors using strawberries, mandarin oranges, pineapple, kiwi and blueberries – beautiful and delicious! With the crispy toasted Flatout Foldit and the sweetened whipped cream cheese, this is a healthy, satisfying sweet treat that kids and adults alike will love. 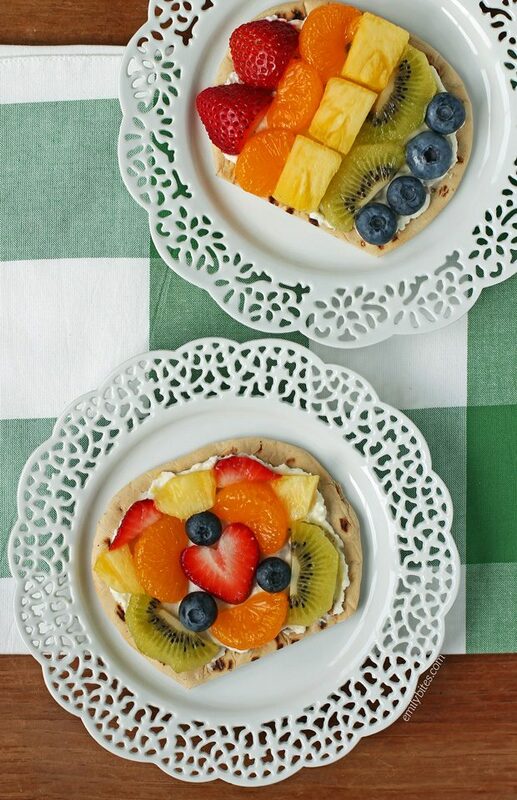 Plus, each of the Fruit Pizza Flats is just 111 calories or 3 Weight Watchers SmartPoints! 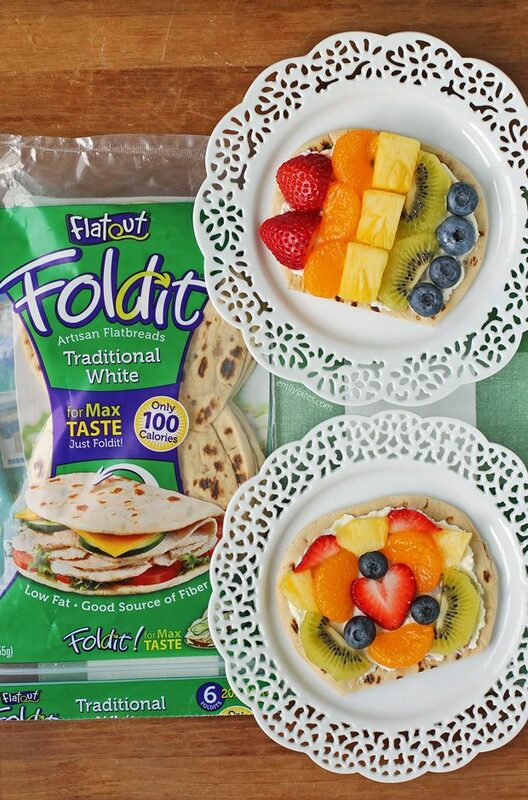 I never run out of new fun ways to use Flatout Flatbreads and Foldits – they’re so versatile! The Foldits are perfect for sandwiches, flatbreads, mini pizzas, desserts and tacos and the flatbreads make amazing wraps, pizzas and pinwheels. They add protein and fiber to any creative meal idea and they taste fantastic. I have used Flatouts for years and I love sharing my recipe ideas with you, but Flatouts are also great to keep on hand for quick and easy meals with whatever you have on hand! Flatout’s products are also now endorsed by Weight Watchers so if you’re counting SmartPoints you can find the points values right on the package – so easy! Wondering what else to make with Flatout flatbreads? Check out my Strawberry Avocado Toast Flats, Buffalo Chicken Tacos, Easy Chicken Quesadillas, Barbecue Chicken Bacon Wraps, Taco Flatbreads, Greek Chicken Tacos, Easy Taco Cups, BLT Flatbreads, Apple Cheddar Turkey Wraps, Chicken Caesar Wraps, Veggie Lover’s Flatbread, Black and Blue Steak Wraps, Spicy Southwest Chicken Wraps, Peaches and Cream Dessert Flats, Three Cheese Mushroom Flatbreads, Maple Bacon Breakfast Wraps, Chicken Saltimbocca Sandwiches, Buffalo Chicken Pinwheel Wraps, Spinach Artichoke Flatbreads, Greek Snack Flats, Mexi Burgers with Guacamole, Chinese Chicken Wrap, Chicken Pesto Flatbreads and Bacon Cheeseburger Wraps! Slice your Foldit in half at the seam to make two rounds. Toast in your toaster oven to desired darkness*. While the Foldit is toasting, mix the cream cheese and powdered sugar in a small dish. Spread each toasted round with a tablespoon of the sweetened whipped cream cheese. Top the cream cheese with your desired fruit and serve. This looks yummy! It reminds me of an appetizer we used to make for parties called Veggie Pizza. It would be perfect on a Flatout too! We used crescent rolls for the crust, then some sort of mixture with cream cheese, seasonings (including fresh dill) as the next layer, then chopped fresh veggies and shredded cheese to top it off. I think I have a similar recipe to what you’re talking about: http://emilybites.com/2016/07/veggie-lovers-flatbread.html. I hope you try it!